If you haven’t heard of Slavoj Žižek yet, well, now’s the time! He’s a Slovenian philosopher. In many ways he fulfills the stereotype that the phrase “Slovenian philosopher” brings to mind. He has an intense yet approachable speaking style, strangely charismatic while being slightly disgusting. YouTube has many videos of his speeches. He clearly doesn’t seem to care how he’s dressed and exhibits tics worthy of a cokehead at 3am on a Saturday night. I find his writings hard to understand, except for a few like the first version of his “Welcome to the Desert of the Real” essay, written shortly after 9/11. His speeches, however, are much more digestible, with accessible examples and jokes, but packed with insights and provocations. He focuses on exposing the role of ideology all around us (or perhaps I should say underneath us and within us), from toilets to cinema. Two quick thoughts: number one, I see a parallel in my own communication, between fairly obtuse writing versus far more clear speaking. I hope to use this insight to make my own writing more clear. 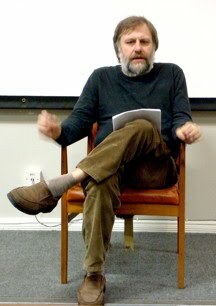 However, it must be said, Žižek is relatively easy to read for a philosopher. Try Habermas sometime. Or Kant. If only we had YouTube videos of Kant…. Secondly, I see us as a culture “waking up” and becoming increasingly conscious of ourselves and our culture. Ideology is like the subconscious of our culture. We want to grow into a fully adult society, not entirely “rational” perhaps (no human is), but able to function in a reasonably self-aware way. Interrogating the ideologies of everyday life is a necessary step, and Žižek is like a shrink in helping us do so – but we must participate individually and collectively and take this task further. The Internet Encyclopedia of Philosophy has a really great summary of some of Žižek’s thought.